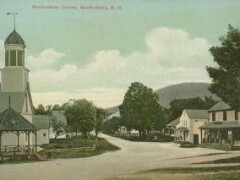 Moutonborough, New Hampshire has set a precedent for accountability. Their attitude is that they want both students and local citizens to participate in fundraisers to accomplish the goals they set. The New Hampshire residents are not looking to State or Federal assistance, but, are continuing the kind of grassroots responsibility that the people of the state are known for. This positive attitude includes their goal to get an electronic scoreboard for the Moultonborough Middle School. The RAB (Recreation Advisory Board) in Moultonborough have some incredibly lofty goals. It might be said that if anyone can reach these goals, the people of Moultonborough can. Moultonborough has previously instituted fundraisers in other areas such as library and chemical free proms. The electronic scoreboard that is being proposed would cover a variety of sports at the middle school, including baseball, soccer and basketball. 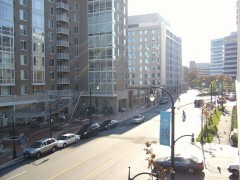 A thriving and bustling city just north of the nation’s capital, Silver Spring was literally named after the glittering silver of mica in a fresh water spring. The convenience of the location, combined with natural beauty has continued to carry the town to a level of both financial and political success today. The town’s love of sports is exemplified in every day life through their intense youth organizations and camps that focus on football, baseball, soccer and rugby. Pretty much everywhere you look there are games and scoreboards for this varied sports city. Francis Blair along with Elizabeth, his daughter, found the spring in a tucked away area. It was glittering with natural mica, a mineral that flakes easily, and became the mesmerizing view that affected their decision to establish a settlement. Three families in total built mansions and homes in the area and successive generations became many contributing members of politics and high government positions. Virginia Beach is an incredibly fun place. The beauty of this city is complimented by a pristine beach and cultural delights. The climate of the area is subtropical, with mild winters and warm summers. 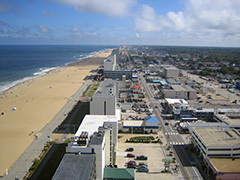 It is home to the Virginia Beach Sportsplex that hosts a variety of soccer and hockey games. Soccer scoreboards are alight with colors of the teams and attendance for the games is usually to a packed house. You would think that this type of perfection would have made the city a booming metropolis from the start, but Virginia Beach had a slow and methodical beginning. 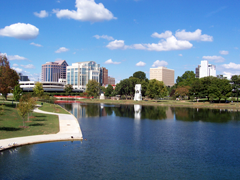 Huntsville is an area in Alabama that experienced many changes throughout its lifetime. While it was initially started as a settlement, it grew to become a major center in the south for a variety of industries. Huntsville also has its heart in their love of sports, which includes football, baseball, soccer, hockey and roller derby. While the area loves most sports, it’s soccer that seems to hit the top of the charts. The many games and the soccer scoreboards are a testimony to the town’s devotion to sports. The original name given to the Huntsville area in 1805 was changed due to the lack of support for the British. The new name honored the former citizen, John Hunt, who had to relinquish his stay and relocate further south. In this soccer scoreboards feature, I have listed the five biggest stadiums in the world, but they are not necessarily not used regularly, nor are they the best soccer stadiums in the world. What I am interested in here is pure seating capacity. When it comes to the biggest of the all, expect a surprise! Who hasn’t heard of this stadium? Camp Now which means ‘new field’ is the home stadium of the best club in the world, Barcelona. This stadium can accommodate 98,772 people and it has seen some amazing matches take place over the years. This is my favorite stadium in Europe. If you get a seat right at the top tier, the feeling is indescribable. The vastness of the stadium is simply awesome. Fences in English soccer stadiums – Why Some Fans Even Miss Them! In this soccer scoreboards feature, I have taken a look at the hot topic of fences at English soccer stadiums. Thought to be widely unpopular, they are in fact missed by many older soccer fans across the country. In this article I explain why. In the rough and ready days of the late 70’s to the early 1990’s, when soccer clubs still belonged to fans, and not to billionaire foreign business interests, one of the most distinguishing features of stadiums we no longer see today was the obligatory fences surrounded the terracing in all UK stadiums. Euro 2012 – Will the Stadiums in Ukraine be Ready? It’s exactly one year before Euro 2012 kicks off, and it doesn’t come as much of a surprise to many that Ukraine is struggling to construct their stadiums in time, despite official assurances that everything will be ready. In this soccer scoreboards feature, I have taken a look at the two stadiums that are causing the most concern, and ask, will they be ready? Lviv is located in Western Ukraine, very close to the Polish border. It has a moderately successful soccer team which player in the Ukrainian Premier league, but its stadium was too small and outdated to be considered for the Euro championship (for instance, its soccer scoreboards are still analogue!) Work began on a new 30,000 capacity stadium three years ago, and it was due to be completed by the end of this summer. Ukraine is supposed to play Austria in a friendly in that stadium in November of this year, but already it is looking like that match will have to be moved. Standing in English Soccer Stadiums – The Principal Reasons For and Against It. In this feature on soccer scoreboards, I will look at the debate concerning standing being allowed in English soccer stadiums once again. Is it good idea, or should things be left as they are? 20 years ago, standing in English soccer stadiums was banned, because of what is known as the Hillsborough disaster. It happened during an FA Cup semi-final between Nottingham Forest and Liverpool in 1989. Because in those days standing was allowed on terraces, one of these terraces collapsed, and 96 people died as a result. In this feature on soccer scoreboards, I will talk about how Qatar plans to avoid “white elephants” after the World Cup of 2022 is over. Many countries have made this mistake. The 2004 Olympic Stadium in Athens. The ‘Bird’s Nest’ Olympic Stadium of 2008 in Beijing. The 2010 World Cup Stadiums scattered all over South Africa. Some of these stadiums were built from scratch and required multi-million dollar investments. What’s happened to all of them now? Nothing – and that’s the whole point. They are just standing there, going unused. Some of them host events very occasionally, but the costs of running them for small games are far greater than the revenue that comes from small crowds. Other stadiums have become mere tourist attractions. In this feature on soccer scoreboards, I will talk about the worst disasters that soccer stadiums have ever seen. This is one of the first disasters recorded in soccer history. On April 5th, 1902, not long before a match between England and Scotland was going to start, the West Tribune Stand, which had been newly built, collapsed right onto the fans. Hundreds of people fell to the ground below the seats, some almost 40 feet. The death toll was 25 and 500 people suffered injuries. The stand was said to have collapsed because of heavy rain the night before. 1. Barcelona, Spain – Camp Nou. The FC Barcelona home stadium is definitely up there with the world’s best stadiums, and it is home to quite possibly the best soccer team in the world. Camp Nou, which means ‘New Field’ translated from Catalan, used to be a nickname for the stadium. It was called Estadi del Barcelona, but then the nickname became more popular than the name itself. The seating capacity of Camp Nou is almost 100,000 fans. In a soccer scoreboards feature, I have reviewed the 2nd leg of the Champions league semi-final. The finalists for the UEFA Champions League have been decided. Barcelona and Manchester United will be playing at Wembley on May 28th. Barcelona had a tough 2nd leg semi-final against their arch rivals, Real Madrid while Manchester United won quite comfortably against Schalke. Barcelona had the advantage of 2 goals from the 1st leg with Manchester United also having the same advantage. Barcelona won 3-1 on aggregate and the soccer scoreboards showed that Manchester United won 6-1 on aggregate. In a soccer scoreboards feature, I have reviews the last round of the Champions league, and look forward to the games this week. The wait is over. 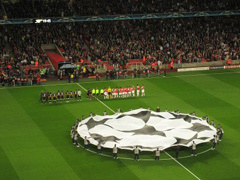 The much awaited knockout stage of the Champions League has begun. Real Madrid, Barcelona, Manchester United and Schalke won their respective matches in the 1st leg. Barcelona and Schalke fired 5 goals each in their matches against Shakhtar Donetsk and Inter Milan respectively. In a soccer scoreboards feature, I have found out who the four fastest players are to have played in the 2010 World Cup. The World cup last year was riddled with unexpected outcomes; the favorite teams failed to get past even the initial round (France and Italy) while, the underdogs (Netherlands) went on to the finals. This era’s soccer is all about speed; the speed at which the player can hit the ball, the speed at which he can run, the swiftness with which he can maneuver the ball, and last year’s World Cup was no different. Soccer proved to be the only sport that wasn’t affected by the economic downturn, and in fact various clubs showed a growth in revenues. Real Madrid earned a record revenue of €401.4 million. The clubs fought hard to earn more and more, with English clubs facing problems to keep up with other clubs as the euro and pound fell 11% and 17% respectively as compared to dollar during the period June 2008 to June 2009. Here we take a look at the soccer scoreboards top 5 richest soccer clubs in the World today. In a soccer scoreboards feature, we take a look at the best clubs in Europe at the moment.